Photos: Effraim, Alberto Moya and Ruben Vigil. 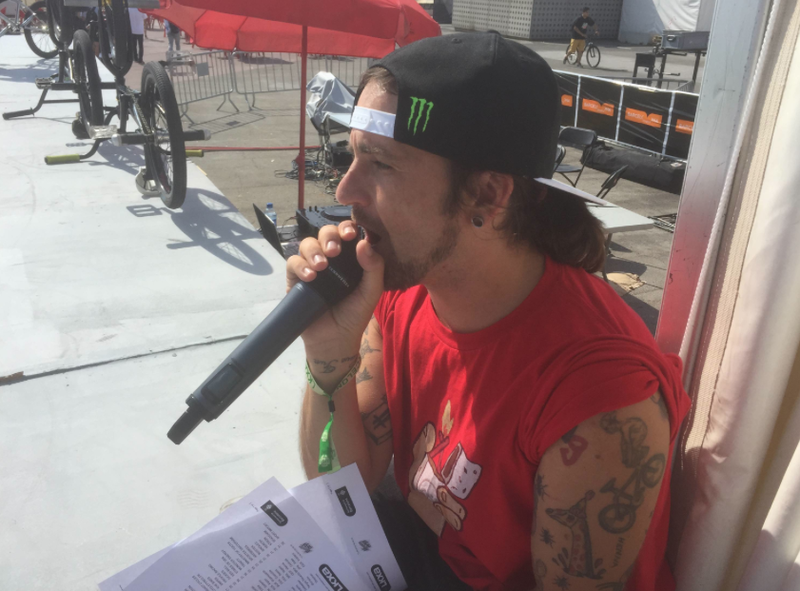 When I was at Bike Days in Switzerland one month ago I was invited to also to judge Round 2 of the 2015 World Circuit in Barcelona. 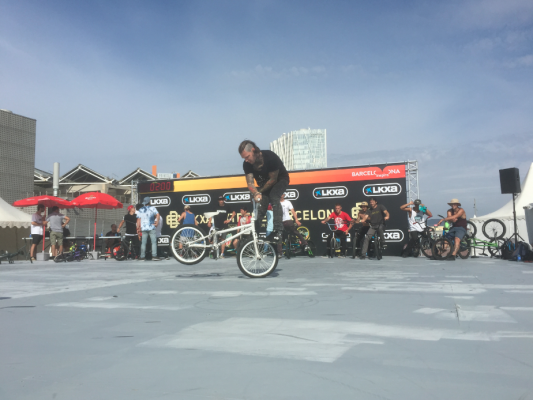 BCN is one of my favourite cities in the world, that hold many memories from when I competed in the Euro XGames and so on so it’s pretty much a no brainer for me. The flight from London is also only one hour 45 minutes so it’s nothing at all. And even better it was my girlfriends birthday on the Wednesday, so we stayed a lil’ extra few days and made a holiday out of it after the contest. Viki Gomez, gliding junkyard on the freshly painted floor before prelims. When I arrived on Friday afternoon I was greeted by the spanish sunshine and a nice 28C, pretty nice conditions as I expected. To my surprise, we were staying on the contest site at Parc del Forum, the venue for the 92′ Olympics. If you follow me on Facebook, you will have been a photo of the solar power and we are staying underneath in the sailing hostel. Naoto Tamaru, made a big impression during the qualifying. X-hand gliding junkyard, photo by Ruben Vigil. 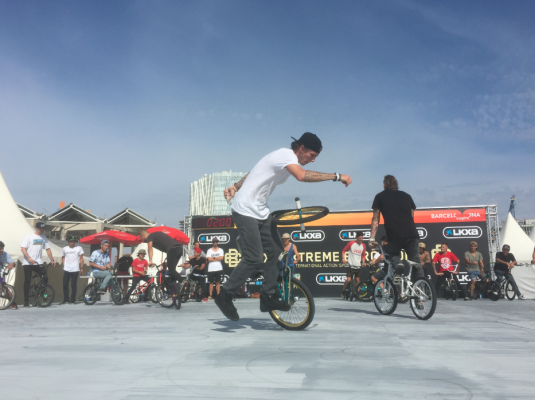 The flatland area this year was moved to the main area of the event surrounded by shops, cafes, ramp set ups for kids to have a go. Over on the raised flatland area, all the riders were struggling with the floor during practise, few panels sticking up and uber slippery. Thankfully the organisers run a dialled set up and were able to paint the floor and fix some of the problems in time to be ready for Saturday morning when prelims started the floor was good to go. Judges for the day: Myself, Iker Guerrero, Mike S and Alexis Desolneux. Catfish was in town since the Fise contest and killed it on the mic all day! Saturday was a pretty full on day of judging from 10:30 till 4:30. There was a lil’ coastal breeze and cloudy conditions this year, so thankfully I didn’t get as sunburnt as last year. We took 41 riders down to 12, then down to 6, Catfish on the mic which is always great to get the crowd hyped. As always with contests, there are surprises. Some familiar names not in the finals, Thomas Noyer, Joris Bretagnolles, Jason Plourde, Alberto Moya, Bruno Zebu, Raphael Chiquet, Sebastian Grubinger, amongst others. It seemed to be a feature of the qualifying that a lot messed up, which makes life as a judge a whole lot easier when you are dealing with 41 riders. 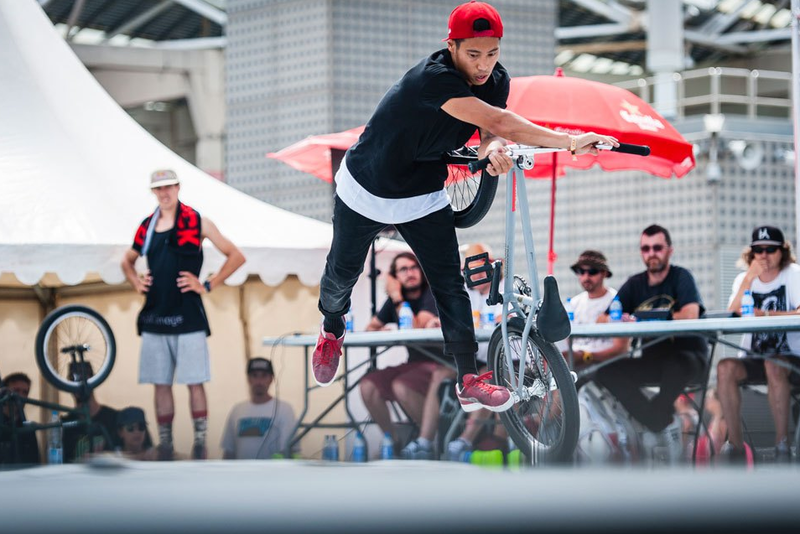 Shouts to Naoto Tamaru who had a killer qualifying run, and earned a top 4 spot into the next round. 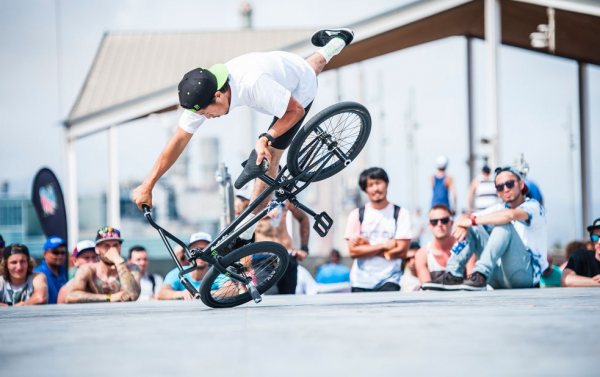 Tsutomu Kitayama warming up for the finals,mid xft crack combo! To my surprise, the 2014 World Circuit Champion Yohei Uchino was not in attendance, I hear rumours on the grapevine Ucchie is working on a new style and isn’t ready to compete yet. But he is at the Matthias Dandois invitational this weekend in Marseille, so for now at least all I can say it looks like we will see a new World Circuit champion this year. My view from the judges table, iPad live scoring. The semi finals from 12 riders down to 6 was intense! 2 minute run plus last trick. 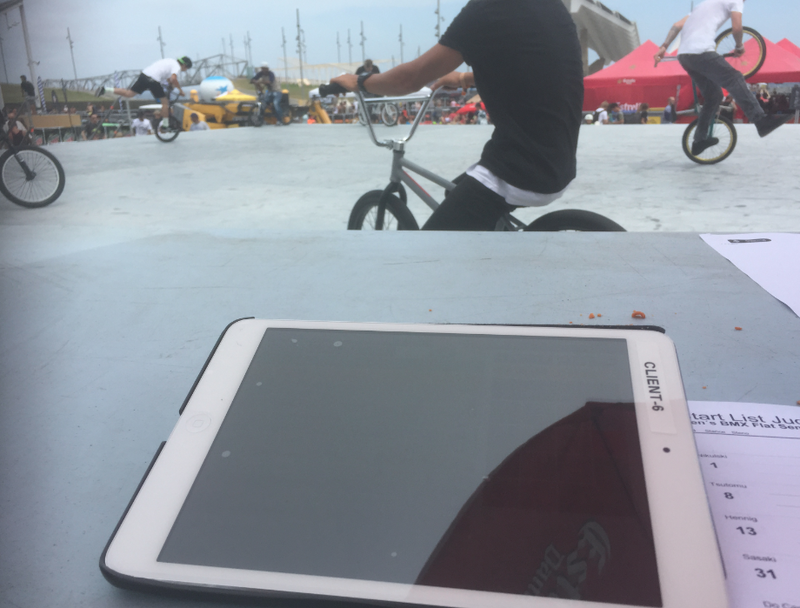 As the contest was running on Spanish TV, we used iPads to have live scoring which was great for the audience and the crowd. A few guys messed up a bit which eft them out the final, although getting to the last 12 out of 41 riders is an achievement in itself. Respect to Kevin Nikulski, Naoto Tamaru, Shinichi “Russia” Kiba, Tsutomu Kitayama, Balu, and Dan Hennig. Shouts to Dominik Nekolny who dropped an amazing flawless semi final run, that left the whole place in awe. Dub nailed this signature switch-b undertaker line in qualifying, unreal! The final 6 live on the air, felt like XGames era all over again. Riders having to take their face shot before they start and wait for the TV, just a lil moment to add to the tension. 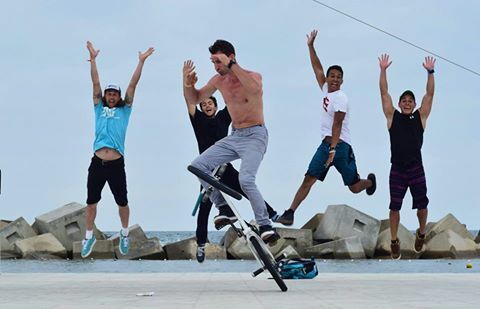 And some familiar faces in the final round, Jean William Prevost aka Dub, Viki Gomez, Alex Jumelin, Matthias Dandois, Dominik Nekolny, and Moto Sasaki! 12 year old, Takumi Isogai who competed in the contest warmed up the finals with multiple turbine xft steams, and worked the crowd with his pumping crackpacker and half packer lines, so good to see Russia bring this talented kid over to Europe to get a taste of the Euro scene. I’m sure its an experience he will remember forever. 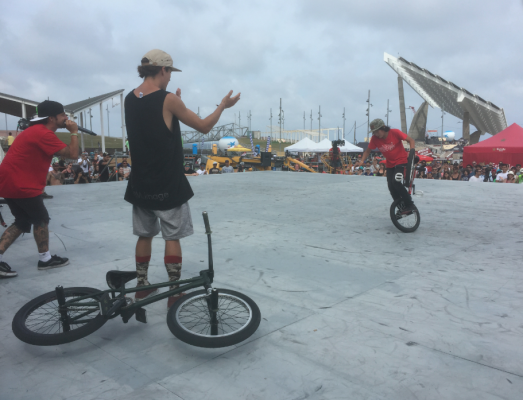 12 year old, Takumi Isogai works the crowd into a frenzy, Viki Gomez and Catfish show their respect! Moto didn’t have the best day and struggled with the floor and with the spinning karl on pedal, possibly the higher crossbar set up and seat higher, seems like he’s getting used to that set up still. I hear a lot of rumours about his practise combos away from the contest area, I look forward to when he drops those! Sixth place for Moto! Classic Moto Sasaki, photo by Ruben Vigil. In 5th place, the explosive Jean William Prevost who as usual is a whole bundle of energy weaving his way in and out of his signature pivots and nailing the forklift, a few crashes hurt his score on this day! During practise warm up, Dub was on fire and looking good to take the win. Dominik Nekolny who I previously mentioned dropped the run of the day in semis, couldn’t hold it together in the finals. Missing the half hiker jump to half hiker, and his last trick the infamous two footed xft steam kick flip to crackpacker, if he would have nailed that it might have been a whole different story. Dominik Nekolny, xft karl turbine steam mid switch. The podium finishes as always are super tight, Alex Jumelin had an amazing run, nailing a sweet 720 nose, and a crazy xft nose manual jump to regular backwards nose, it was one of those moments where it looked like he was going to crash but he hung on and held the backwards nose, so good! The top 2 was a serious battle, and like I already said super close, Viki Gomez rode first and dropped a one touch run full of Viki Gomez signature moves like steam kick flip to half packer pivot to xft spinning hitch juggle to x-ft steam drop to back wheel forward g-roll to backwards spinning ice cream. After his first mistake he hit everything including his last trick, xft full body varial scuffless gerator to peg wheelie into dump truck turbine varial out in signature Viki perfection execution style. 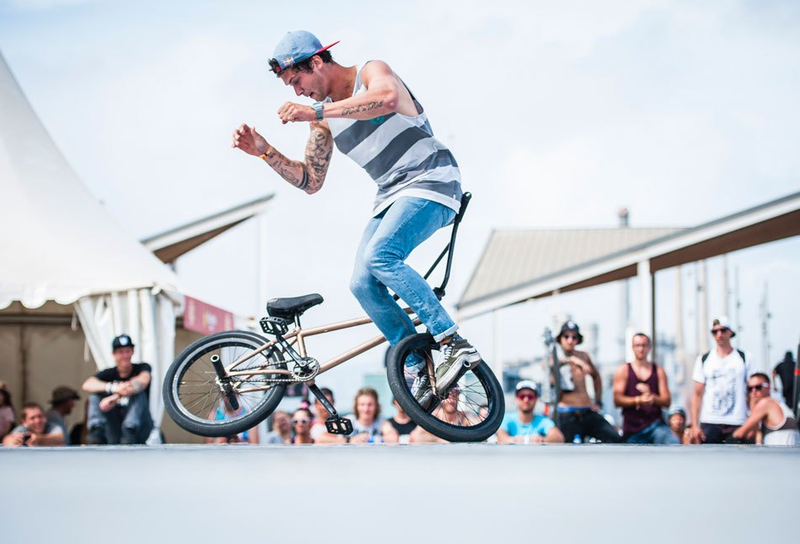 Matthias Dandois, signature no handed spinning halfpacker, photo by Ruben Vigil. Matthias Dandois came out and dropped a one touch run, with his signature spinning no handed half packer, and backwards spinning tomahawk to crackpacker. Two judges gave the win to Matthias, two judges to Viki, Viki just came out on top! It could have gone either way to be honest! Great to see a proper close battle for the top spot, that’s how it should be. Congratulations to Viki Gomez taking the win, not only showing so much control, but also making it look easy with his execution and originality, too much style! Once the contest was done, podium shots taken. All the riders headed out to downtown Barcelona for a meal, and then hit up the infamous Apollo club where Nasty Mondays goes down. The spanish culture is so different than what I’m used to, people generally don’t go out until 2-3pm in the morning, by which time I’m done and ready to go sleep. 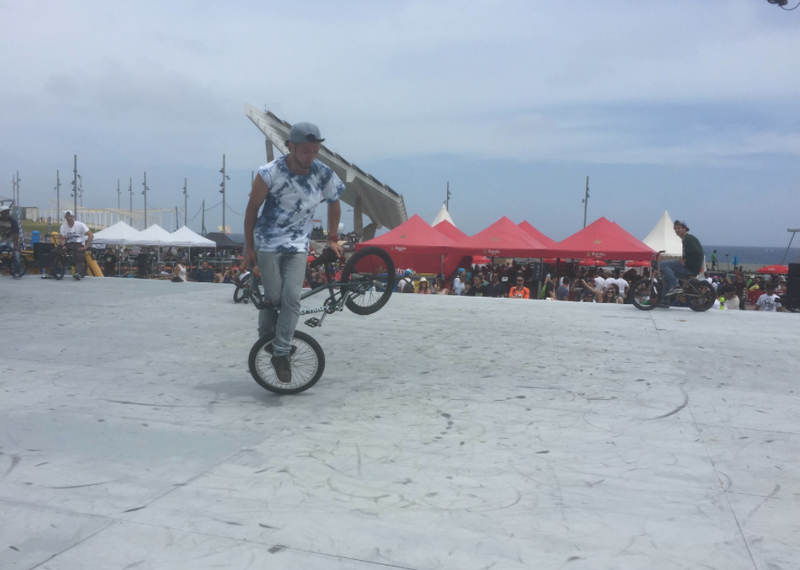 It’s not all serious at contests! Joris Bretagnolles and some time machine fun! Photo: Alberto Moya. BCN is an amazing city, full of modern and contemporary architecture and culture. Riding spots all over, on the Sunday after the contest I rode around the city with James McGraw, Dub, and Jason Plourde, an amazing session went down in the evening with Dub hitting a brand new move for the first time. It was quite an experience to see, but I will save that banger for Dub to drop some day he feels like. Round 2 of the 2015 World Circuit is a wrap, Viki Gomez is in the lead at the top with two wins in a row under his belt, the Voodoo Jam is the next stop, stay tuned for an interview with Scott O’Brien next week! Peep the highlights video from the Extreme Barcelona contest! Hope you all enjoyed my break down of Round 2 of the World Circuit. I’m out! 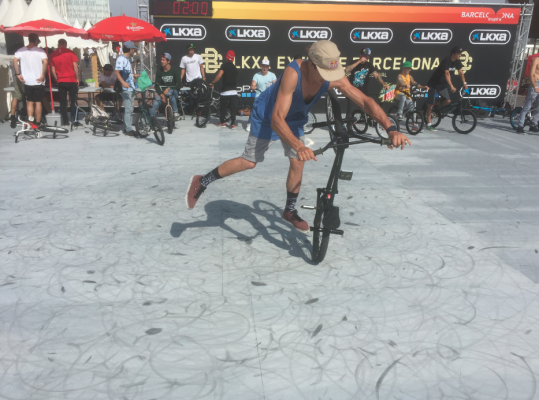 This entry was posted in Articles, Contest edits, Events, Exclusives, News and tagged Alex Jumelin, Battle in the Rockies Day 5 - Dub & Dominik Nekolny take the cash Prejam 2, Catfish, Jean Wiliam Prevost, Matthias Dandois, Moto Sasaki, Naoto Tamaru, Repo: Extreme Barcelona, Takumi Isogai, Viki Gomez by Effraim. Bookmark the permalink. This was a amazing event and also have so much fun in that! BCN is awesome! 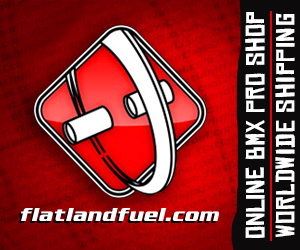 Thanks to all the riders!! Great to meet you Bruno! Hope you had a safe flight home, such a long way! Respect! 12 years old in pro finals?? Mind blowing… great contest write up! Ultra Zoffy, not in finals invited to do lil show to open finals. Great motivation and experience for him! He competed, not in finals but warmed up the finals (final 6). Great experience for such a young rider with a great future! Thank you for the props Ultra Zoffy! So glad to hear Dom is bringing back the x ft steam kickflip to crackpacker! I absolutely loved when he dropped that without warning at the Redbull Fight with Flight contest a few years back. I did ask him at Bike Days Prasheel, maybe something to do with that coming back. Amazing trick! Thank you Valance, glad you enjoyed and got something out of it!